Alliteration happens when words that start with the same sound (not just the same letter) are used repeatedly in a phrase or sentence. The sound is usually a consonant and the words don't have to be right next to one another. One of the fun features of alliteration is when it becomes a tongue twister. Get ready to bring on some giggles as you explore these alliteration examples for kids. Note that alliteration does not depend on letters but on sounds, so "Kim came" is alliteration, even though the the words start with different letters. Come and clean the chaos in your closet. The big, bad bear scared all the baby bunnies by the bushes. Shut the shutters before the banging sound makes you shudder. Go and gather the green leaves on the grass. Please put away your paints and practice the piano. Round and round she ran until she realized she was running round and round. I had to hurry home where grandma was waiting for her waffles. The boy buzzed around as busy as a bee. Garry grumpily gathered the garbage. Those lazy lizards are lying like lumps in the leaves. Paula planted the pretty pink poppies in the pot. Kim came to help us cut out a colorful kite for Chris. Bake a big cake with lots of butter and bring it to the birthday bash. Paula's prancing pony out-performed all the others. Little Larry likes licking the sticky lollipop. Reading or listening to alliteration in nursery rhymes and stories are fun and entertaining for children. They can also help kids develop memory skills and phonics awareness. "Three grey geese in a green field grazing. Grey were the geese and green was the grazing." "Great Aunt Nellie and Brent Bernard who watch with wild wonder at the wide window as the beautiful birds begin to bite into the bountiful birdseed." "Betty Botter bought some butter, but she said, this butter's bitter; if I put it in my batter, it will make my batter bitter, but a bit of better butter will make my batter better." "My counters and cupboards were completely cleared of carrot cake, cornbread and crackers." "Slowly the slug started up the steep surface, stringing behind it scribble sparkling like silk." Here are some fun tongue-twister examples. Try saying them quickly! How much wood would a woodchuck chuck; If a woodchuck would chuck wood? A woodchuck would chuck all the wood he could chuck; If a woodchuck would chuck wood. Silly Sally swiftly shooed seven silly sheep. The seven silly sheep Silly Sally shooed shilly-shallied south. 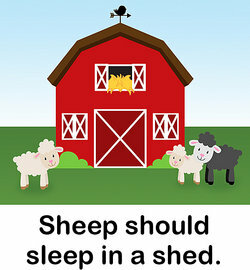 These sheep shouldn't sleep in a shack. So, alliteration is an exciting way to illustrate major points and make names memorable. Teaching kids to incorporate this into their creative writing is a fabulous way to spark a lifelong love for the written word. When you're ready, we hope you'll continue the journey with more Alliteration Examples. And, when it's time for completely new heights, maybe you'll even sprinkle in a few Examples of Alliteration Poems. "Alliteration Examples for Kids." YourDictionary, n.d. Web. 23 April 2019. <https://examples.yourdictionary.com/alliteration-examples-for-kids.html>. Alliteration happens when words that start with the same sound (not just the same letter) are used repeatedly in a phrase or sentence. The sound is usually a consonant and the words don’t have to be right next to one another.One of the fun features of alliteration is when it becomes a tongue twister. Get ready to bring on some giggles as you explore these alliteration examples for kids.